I’m going to make you drool today. And it isn’t going to be with dripping chocolate. Every now and then we do eat something other than cookies, donuts and cake. And when we do, it’s often stuffed with potatoes, cheese or bacon. Last month I made a Egg & Potato Casserole for OhioEggs.com. I took that recipe and turned it into a gluten free breakfast casserole that we not only ate for breakfast, but for lunch and dinner as well. White sauce with seasonings, potatoes, cheese, hard-boiled eggs and bacon. Let’s talk about these layers! White Sauce: I made a simple white sauce with butter, tapioca flour, milk and seasonings. Don’t need gluten free? Use all-purpose flour. Need dairy free? Use cashew milk. I seasoned this sauce with some of my favorite breakfast sausage seasonings. So easy. Potatoes: I took the lazy quick route and used store-bought frozen shredded potatoes (a 30-ounce bag). You can shred your own if you’d like. If you are using fresh potatoes, I’d make about 4-5 cups. Hard-Boiled Eggs: Have you ever had a brunch casserole with hardboiled eggs? 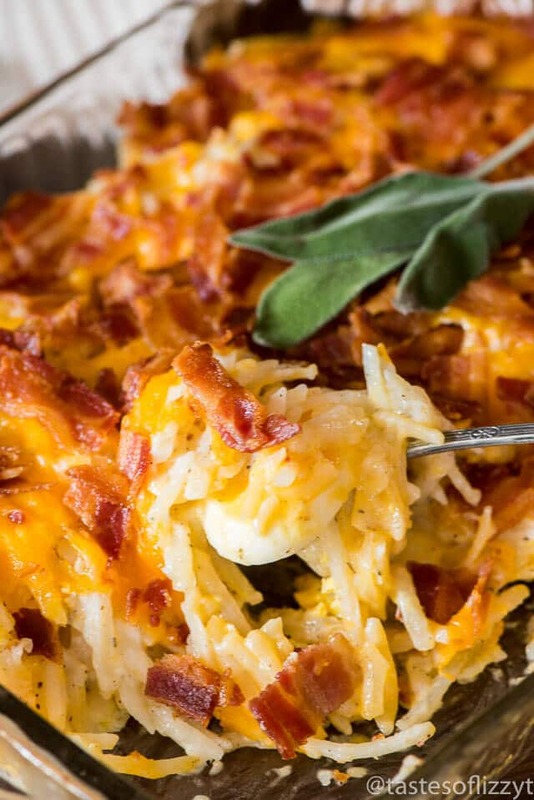 This casserole recipe comes from my favorite Amish cookbook. I had made it years ago, and it just happened to pop into my mind a few weeks ago when hard-boiling some eggs. With Easter just around the corner, this recipe is perfect. It would be a great way to use up those decorated Easter eggs! Bacon: Cook some bacon (the oven method is my favorite way to cook bacon), chop it and top the casserole with the bacon bits. My favorite brand of bacon? Hormel Natural Choice Uncured Bacon. In the original version of this recipe, I had a buttery, cracker-crumb topping. To make this go-round gluten free, I decided to switch that topping to a bacon topping. Because bacon is just as good (if not better) than buttery crackers. We’ve made this casserole several times in the past few weeks and I just bought the ingredients again today to make it again this weekend. So…did I make you drool? Because I may be drooling after telling you about it. Pour the frozen shredded potatoes into a large bowl. To make the white sauce, melt the butter in a saucepan over medium-low heat. Once the butter is melted, add the tapioca flour and whisk until clumps are gone. Remove from the heat and stir in salt, pepper, ginger, sage and paprika. Pour the white sauce over the shredded potatoes, mix and set aside. Then sprinkle the cooked & crumbled bacon over the cheese. I have never seen a breakfast casserole with hard boiled eggs! I need to try this. We have a different variation of eggs at least once a week…. What share buttons do you use? I like how they are outlined. I need to get different buttons on my site! What a good idea using hard boiled eggs! And so timely with Easter right around the corner! I can’t wait to try this out! Can I substitute the hard boiled eggs for raw? You probably could, just be sure that it is cooked thoroughly and the texture will probably be different. Looks yummy but way to much food for 1 person to eat. Wonder how hard it would be to scale down that sauce so it could be made in the toaster oven for just one person. I think you could pretty easily half this recipe! My easy recipe for egg is just letting them hard boiled, but your breakfast casserole recipe sounds delicious and worth taking time in the morning to make for my family. Thank you so much for sharing, I love it ! You’re welcome! The leftovers of this casserole are so good, too! It probably could….I haven’t tried it that way, but it is a good idea! I believe it can! I haven’t tried it, but it should work. Since no grocery stores sell shredded potatoes(only actual hash browns) I am going to shred the potatoes I have for this recipe. Should I cook the potatoes first and Tim then shred or just shred uncooked and add to casserole. Not sure they would cook if it calls for only 30 min in oven. I think if the potatoes were shredded finely enough, they’d cook, but feel free to cook them a bit ahead of time!